Pernille Harder (Denmark, Linköping and Wolfsburg), Dzsenifer Marozsán (Germany, Lyon) and Lieke Martens (Netherlands, Rosengård and Barcelona) are the three nominees for the UEFA Women’s Player of the Year award. Two English players also make the longer list of the top ten, with Lucy Bronze and Jodie Taylor recognized. The award will be presented to the winner at the 2017/18 UEFA Champions League group stage draw ceremony, which will take place on Thursday 24 August in Monaco. 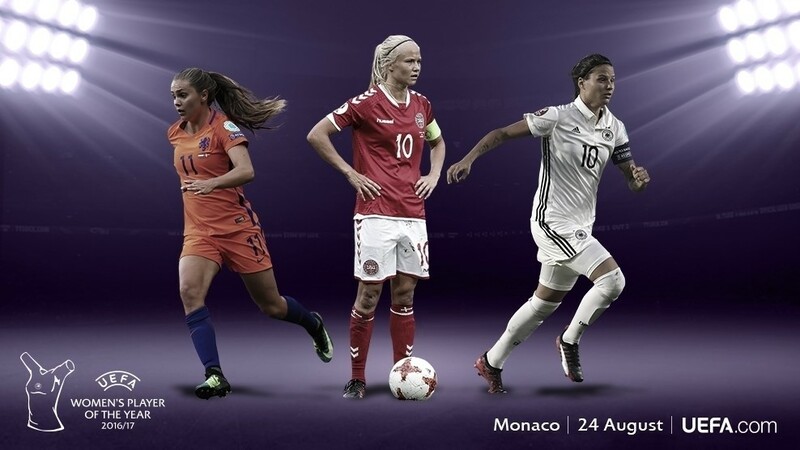 For the women’s award, the shortlist of three players was selected by a jury composed of the coaches of the 16 teams which participated in the recent UEFA Women’s EURO 2017 in the Netherlands, together with the coaches of the eight clubs that reached the quarter-finals of the 2016/17 UEFA Women’s Champions League. Twenty journalists specialising in women’s football and selected by the ESM group were also part of the jury. The UEFA Women’s Player of the Year Award recognises the best players, irrespective of nationality, who played for a club within the territory of a UEFA member association during the past season. Players are judged on their performances in all club and national team competitions – domestic, continental and international.